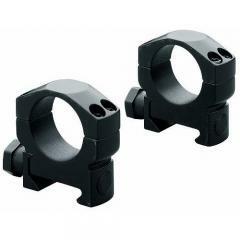 Leupold Mark 4 Tactical Riflescope Rings (Matte Black) FREE SHIPPING! Choose Your Option 1-inch Medium - 0.84"Aluminum 1-inch Medium - 0.84"1-inch Super High - 1.40"Aluminum 1-inch Super High - 1.40"30mm Medium - 0.84"Aluminum 30mm Medium - 0.84"30mm High - 1.06"Aluminum 30mm High - 1.06"30mm Super High - 1.40"Aluminum 30mm Super High - 1.40"
Carry your service weapon or hunting rifle with confidence knowing that the scope is secured using the Mark 4 Tactical Riflescope Rings from Leupold. Poor quality and sloppily constructed mounting rings are one of the number one causes for missed shots in the field and on the range. To ensure accurate shot placement, optics need to be mounted using high quality rings that will keep the scope stable, secure and zeroed in. The Mark 4 does just that. Featuring the same rugged reliability as Leupold's ultra-premium riflescopes, these mounts are built to last. Each one is forged from hardened, high-carbon steel and treated with a corrosion-resistant finish that ensures it can take years of abuse without faltering. The rings are compatible with Mark 4 bases and Picatinny-style rail systems. Aluminum 30mm High - 1.06"
Aluminum 30mm Medium - 0.84"
Aluminum 1-inch Medium - 0.84"
Aluminum 1-inch Super High - 1.40"
Aluminum 30mm Super High - 1.40"
1-inch Super High - 1.40"
30mm Super High - 1.40"
©2002-2019 CopsPlus.com: Leupold Mark 4 Tactical Riflescope Rings (Matte Black) FREE SHIPPING!